MAG290-BLK 10LR/SR M3 7.62X51 Magazine The PMAG 10 LR/SR GEN M3 brings GEN M3 technology to the smallest possible magazine size. Perfect for hunting applications, depending on local hunting laws, and also for states where overall capacity is limited. The 10 round GEN M3 includes all of the benefits of the GEN M3 line. Perfect for use with a bipod or when shooting off of a pack. MAG291-BLK 20LR/SR M3 7.62X51 Magazine The PMAG 20 LR/SR GEN M3 brings the M3 improvements to the 20 round 7.62 NATO/.308 Winchester SR-25 magazine form factor. All of the GEN M3 improvements are here in the 20 round capacity form factor of our previous design. The PMAG 20 LR/SR GEN M3 will replace the MAG243 in our line. 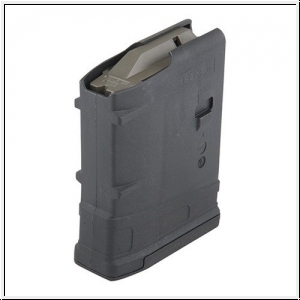 MAG292-BLK 25LR/SR M3 Window 7.62X51 Magazine The PMAG 25 LR/SR GEN M3 is a lightweight, high reliability 25 round polymer magazine for SR-25/M110 rifles and rifles that utilize magazine specifications compatible with these platforms. The PMAG 25 LR/SR brings GEN M3 improvements to the LR line along with "more of a good thing" in the form of 25 rounds of capacity. Keep track of those rounds with MagLevel Window functionality, for the first time, now available in a 7.62 PMAG. The 7.62x51 NATO (.308 Winchester) PMAG 25 M118 LR/SR GEN M3 Window is now compatible with M118 LR ammunition with a max OAL of 2.830". This is a lightweight, cost effective, high reliability magazine for SR25/M110 pattern rifles featuring true 25-round capacity, constant-curve body, anti-tilt follower, snap on Impact/Dust Cover, and features transparent windows to allow rapid visual identification of approximate number of rounds remaining. Please note that this increased length capacity means that the PMAG® 25 M118 LR/SR GEN M3 Window may or may not drop free from some models of weapons. However it can still be pulled free. SPECS: Black Polymer Magazine to fit the AR Style .308 rifle, M110, Mk11, Etc. This Product was added to our catalogue on Thursday, 09. February 2017.